Miguel Palomeque is perched on a large, dry, fallen tree trunk on his cocoa plantation, El Paraíso, situated in the jungle close to a tributary of the River Beni, near Carmen del Emero, a community in the Ixiamas district. He explains that last year, right here, to the north of La Paz, he bagged up ten hundredweight of the fruit used to make chocolate. 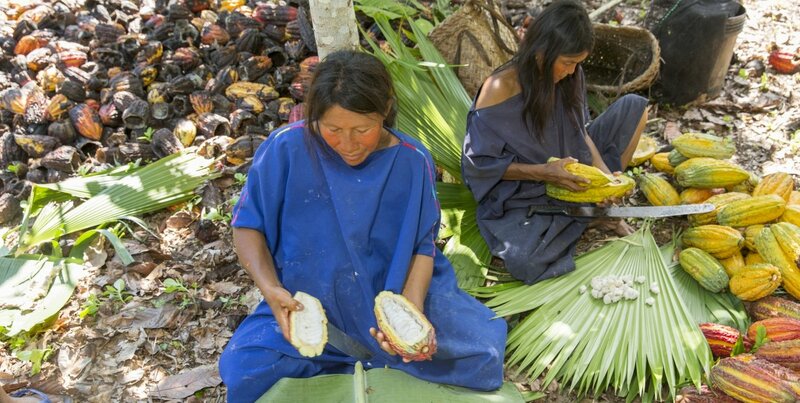 For the 50 Tacana families in this village, a large part of their income comes from the sale of wild cocoa fruit. Harvesting starts in January (or sometimes December) and goes on until March, with some crops lasting until April. This year, the villagers were unable to harvest as much as usual, because the fruit grows in a place to which they must travel via the River Beni. 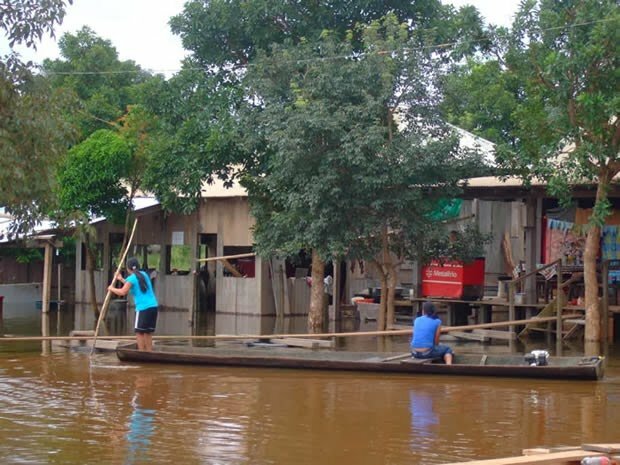 The rise in water level affecting the north of La Paz and part of the Beni district has had a direct impact on the community: the river has risen and dragged trees from its banks into the river, stopping the people from travelling by river to Rurrenabaque, 280 km away, to buy fuel for the engines of their boats. Not only that, but the village has been flooded for weeks under 80 cm of water, meaning all able hands have been needed just to restore the village to normal. 49 years ago, a group of Tacanas from the nearby community of San Pablo, founded Carmen del Emero in honor of their patron. They have built their homes in a sizeable compound, notable for being larger than other villages along the eight-hour journey by river from Rurrenabaque. Our own launch has used 110 liters of fuel to travel from one of the country’s best tourist destinations to the village. The first thing to be seen on dry land is the remains of a brick oven on the patio of a house whose walls are made of wood and whose roof is palm. It is merely the first visible sign of suffering in a community which, like many others around it, have spent weeks at the mercy of flooding greater than any they have known before. On some patios there are wide and elevated structures on the floor, covered in yellow plastic: they look like small greenhouses, but they are actually cocoa fruit dryers. When the harvesters get back from the plantations, they open the fruit up using a knife. The inside of the fruit looks like a corncob without many grains of corn on it, large and covered in a white, juicy pulp. 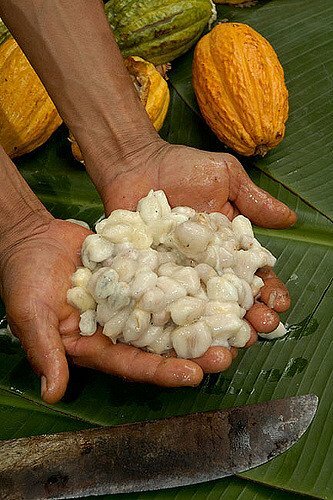 This is the cocoa pulp, which these people call “jane”, and with which you can make a juice similar to that of copuazu (both plants are from the Theobroma family, the first is Theobroma grandiflorum and the second Theobroma cacao) and also vinegar. Under the fine “jane” you find the stuff chocolate is made from: a type of almond, violet in color and with a strong, bitter flavor. Once the fruit is peeled, the villagers leave the pits to ferment for some days, wrapped up in the leaves of patujú (heliconia rostrata) or jute and loaded into boxes. It needs to reach a temperature of 45° C. The amount of time this process will take, in which the cocoa acquires a deeper aroma and a better quality, depends on the climate, explains Róger Yarari. Once the pits have fermented, they are put in the “greenhouses” for about five days, in order to dry out. But for the past few weeks the tents have been half empty. “The rains have affected us greatly. When they come, many plants die”, says one of the harvesters, Katy Marupa, 27 years old, standing in faded knee-length jeans and rubber boots in a cocoa plantation along the brown shores of the Beni. The ground is wet from a recent river swell in which, if you stay in one place, you can find yourself suddenly sinking up to your knees in the mire. If you tread hard, the ground trembles like jelly. “Here, we make a living from chocolate in chocolate season, then fishing after that. Some people are also loggers”, explains Katy. The villagers estimate they lost half of their cocoa production this year. 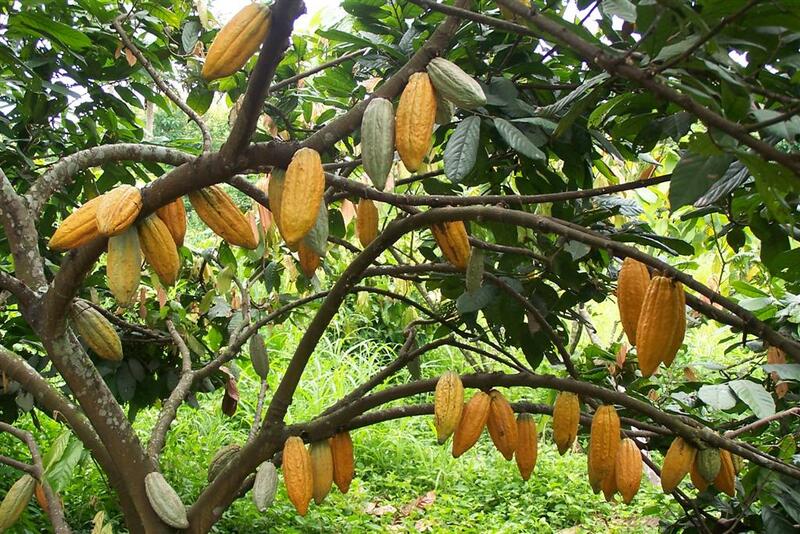 “Wild cacao grows naturally. It has a stronger aroma than the hybrid variety”, comments Katy. In Bolivia there are three wild varieties: two grow in the north of La Paz and one in Beni Department. The hybrid varieties were imported from Trinidad and Tobago, Peru and Ecuador, and their seed gives a higher yield. But chocolate made from wild cocoa costs up to 12 times more.